The trees are planted for you – and the children do the watering. Arlington County is offering a deal to homeowners that looks too good to be true. But don’t let that fool you: It is a great deal and county homeowners should jump on it! It’s called the Tree Canopy Fund and it’s run by Arlingtonians for a Clean Environment and the Arlington County Urban Forestry Commission. Land developers in Arlington bankroll the TCF. The money is used to buy young trees and pay for their installation on the property of participating homeowners. And get the word out to your neighbors to put in their requests. The Tree Canopy Fund is an innovative way to boost the county’s tree canopy, which has been in decline for decades. Over the past 30 years, more than 3,000 acres of county land went from heavy tree cover of over 50 percent to low tree cover of less than 20 percent due in large part to vigorous real estate development and severe storm events. The loss of trees has a profound impact on our quality of life. Not only do trees provide cooling shade, they also do something called evapotranspiration — a process that describes how the leaves of trees exhale minute particles of water that, in turn, cool the air. Due to the loss of tree canopy, Arlington has become a hotter and less hospitable place than it used to be. The Environmental Protection Agency has quantified the effects of a dwindling tree canopy. Surfaces shaded by trees are cooler than unshaded surfaces by as much as 20 to 45 degrees Fahrenheit and tree evapotranspiration can help lower peak summer temperatures by as much as 2 to 9 degrees Fahrenheit, according to EPA’s calculations. Trees do so much for us. By shading buildings they reduce our use of energy by decreasing the need for air conditioning. This, in turn, leads to lower greenhouse emissions and air pollution. Trees also sequester carbon dioxide. And trees reduce stormwater runoff by absorbing and filtering storm water. But that’s not all! Other benefits: Tree shade actually slows down the deterioration of sidewalks. They even muffle noise — all while providing beauty in the landscape. Homeowners who have TCF trees planted on their properties are asked to maintain the tree by watering it, as needed, and protecting its bark from such perils as string trimmers, etc. 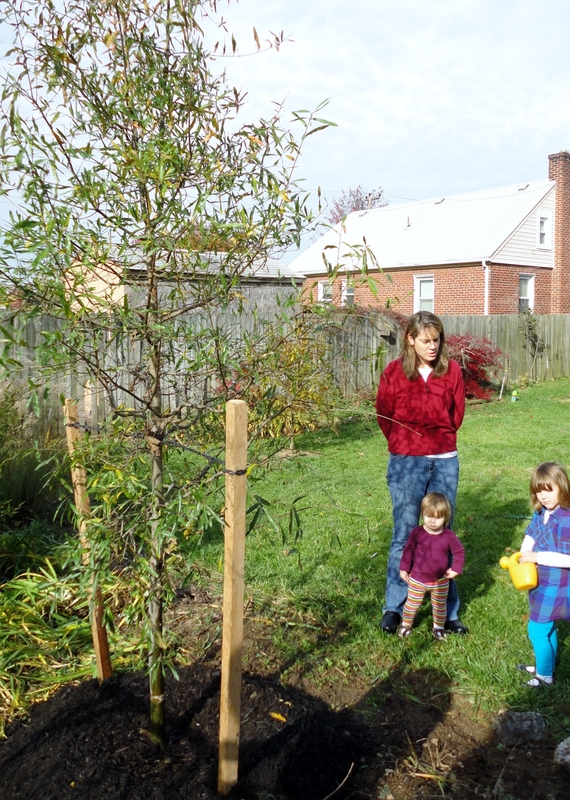 A year after tree planting homeowners file reports on their trees’ condition so Arlingtonians for a Clean Environment can track the program’s success — and where it needs to improve. Applications are due by June 21. Go Trees! This entry was posted in Education, Events and tagged Biology, Botany, Business, Canopy (biology), Dendrology, Fraxinus, greenhouse emissions, June, shade, sustainability, Tree, Tree Canopy Fund. Bookmark the permalink.